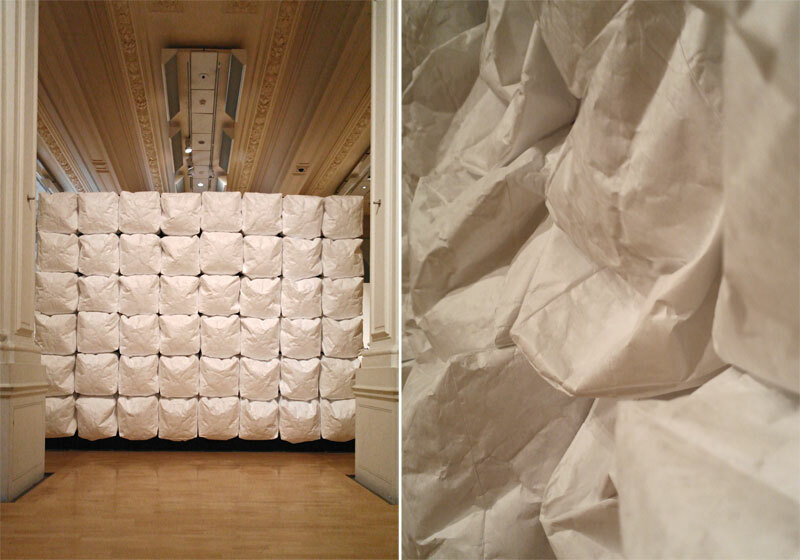 From the catalogue: The installation consists of a matrix of white cushions which are selectively inflated and deflated in controlled rhythms, creating wavelike animations across the wall. Although each bag is mounted in a stationary position, the sequences of inflation and deflation create the impression of lively movements. Forms appear from the net-like matrix and disappear back into the surface. In this way shapes and the boundaries of the installation itself start to dissolve. A custom written program on a micro-controller takes control of the cooling fans which inflate and deflate each cushion. These hidden fans produce an ongoing sonorous sound whilst the bags themselves crumple almost silently. So the observer becomes aware of an underlying technical component but can't certainly define where this soundscape is coming from. The construction consist out of 48 interconnected modules. Each single one is equipped with a white bag, eight cooling fans and custom made electronics. Rge cushions are made from Tyvek, a material which is usually used for moisture barriers, protective clothing or mushroom growing. » Exhibition "Lost in Lace"